The head is triangular and unmarked. There is a sensory pit between the eye and the nostril on each side of the head. The body is marked with dark brown to black chevron-shaped bands and a brown mid-dorsal stripe. The tail is black and ends in a rattle with 1 to 13 or more segments. Massasauga (Sistrurus catenatus) is smaller. The body is blotched, not banded. Mostly small mammals but also birds and bird eggs. Sources: 6, 11, 14, 24, 29, 72, 74. 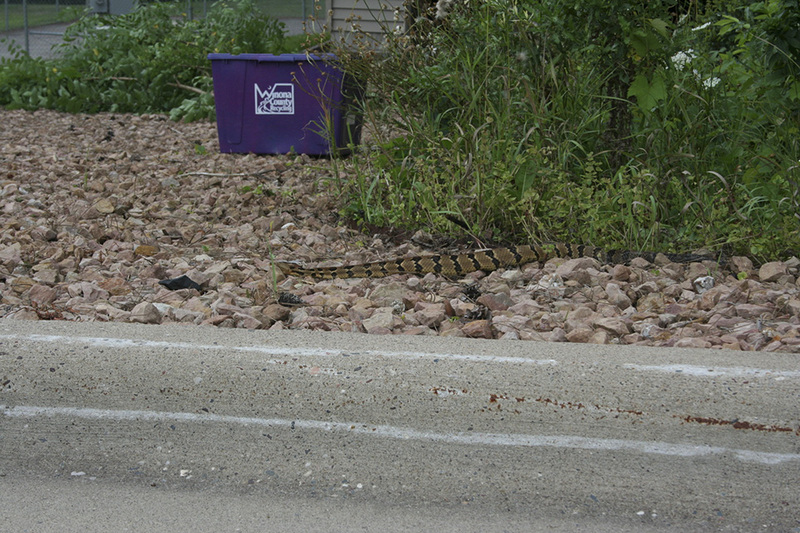 This is one of only two venomous snakes in Minnesota. Description: Tan/brown with dark stripes across back. Orange/brown line down middle of back. Unmarked head. 23-25 keeled scales. Black tail. Warning! Rattlesnakes, Copperheads, and Cottonmouths belong to a group of snakes known as pit vipers. These dangerous snakes have a heat-sensitive sensory organ on each side of the head that enables them to locate warm-blooded prey and strike accurately, even in the dark. The curved, hollow fangs are normally folded back along the jaw. When a pit viper strikes, the fangs rapidly swing forward and fill with venom as the mouth opens. The venom is a complex mixture of proteins that acts primarily on a victim's blood tissue. 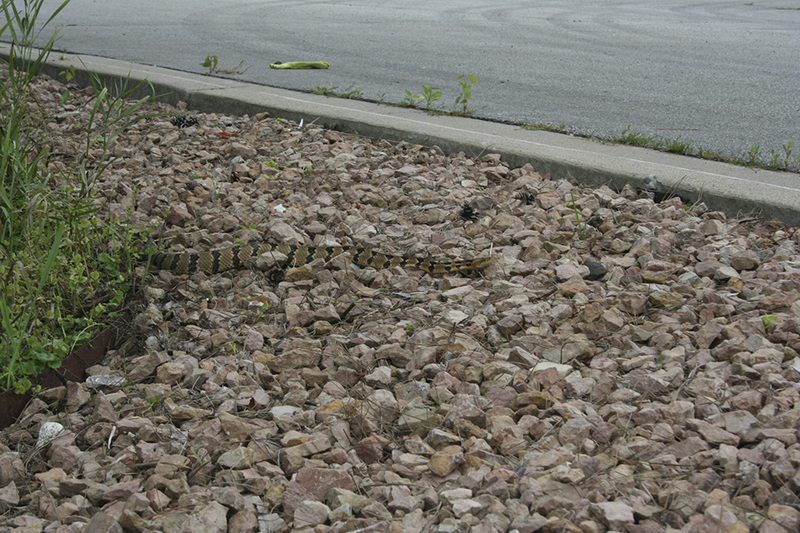 If you hear a rattlesnake shaking its rattle, back away. The snake is issuing a warning, and if the warning is ignored it may bite. There are many factors (temperature being the most important) that determine how a snake will react when confronted by a human. 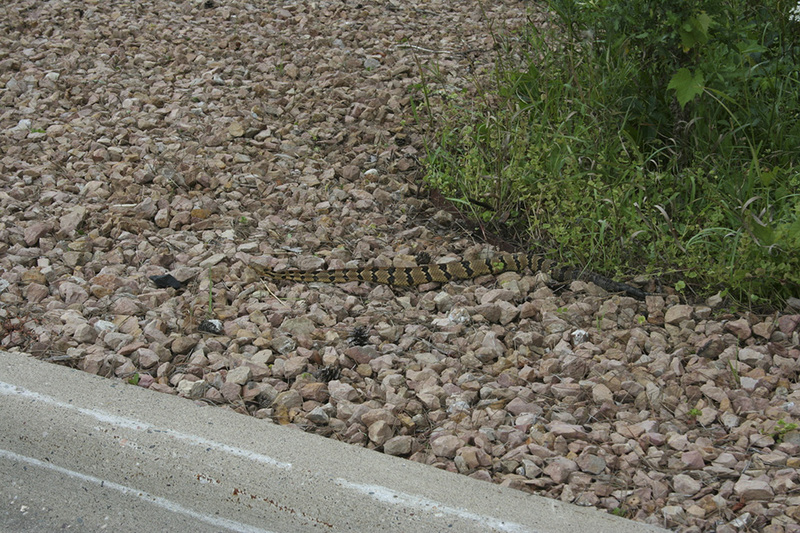 Venomous snakes should always be observed from a safe distance. Pit vipers are never safe to handle. Even dead ones can retain some neurological reflexes, and "road kills" have been known to bite. Breeding: Breeds in spring, after hibernation. Alternative years. 5-17 live young. 25-33cm (10-13") long born August- October. Females breed at 4/5 years. Habitat: Wooded hillsides and rocky outcrops. Range: Maine through Florida. Minnesota and Texas. Discussion: Hibernates in winter, active April-October. Often hibernate with Copperheads and rat snakes. Wait for prey, coiled up. Rats, squirrels and mice form diet. Motionless if approached even by prey until it strikes. Longest living over 30 years. Timber Rattlesnake Hunting Pa 2014. Follow Shane Reed and Ryan Toth as they hunt for big timber rattlesnakes in Lycoming county Pennsylvania. The guys find a group of four big snakes near a log pile. Two of the snakes were males and the other two were female. Shane and Ryan tag out with a 52 and a 51 1/2 black phase timber rattlesnake. Join me as I visit a timber rattlesnake maternity den to see how many snakes I can find.